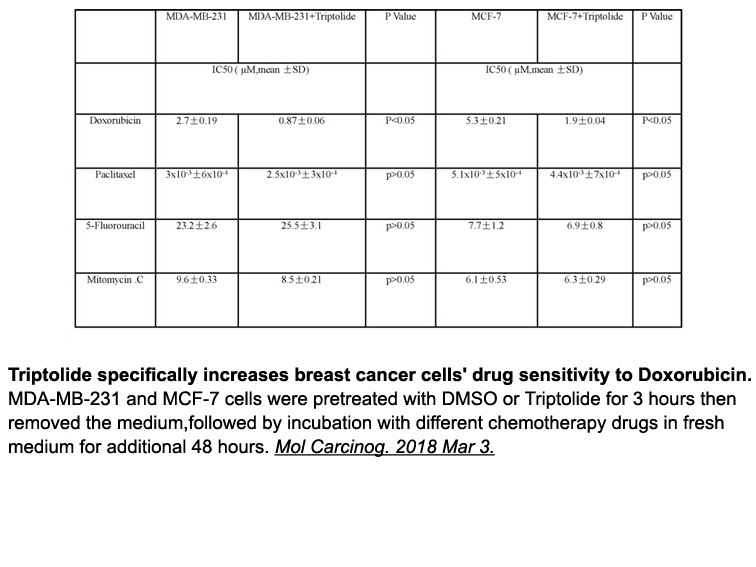 Cells were incubated with YSK-MEND for 24h, and then trypsinized and reseeded in 24-well plates. 24 h after reseeding, the cells were washed with PBS and incubated with DOX-containing medium for 6h. DOX-containing medium was removed, and cells were washed with PBS and recovered 18 h after fresh medium incubation. Protein concentrations determined by the CA method were regarded as a viability. Values indicate mRNA expression relative to nontreatment (NT) ± SD.
. Woo SM, Kim AJ, Choi YK, Shin YC, Cho SG, Ko SG. Synergistic Effect of SH003 and Doxorubicin in Triple-negative Breast Cancer. Phytother Res. 2016 Aug 1.
. Sun W, Kalen AL, Smith BJ, Cullen JJ, Oberley LW. Enhancing the antitumor activity of adriamycin and ionizing radiation. Cancer Res. 2009 May 15;69(10):4294-300. 1. Downregulation of histone deacetylase 1 by microRNA-520h contributes to the chemotherapeutic effect of doxorubicin. FEBS Lett. 2014 Jan 3;588(1):184-91. doi: 10.1016/j.febslet.2013.11.034. Epub 2013 Dec 6. Doxorubicin down-regulates HDAC1 expression and up-regulates miR-520h to induce DNA damage in cancer cells. 2. Nicorandil ameliorates mitochondrial dysfunction in doxorubicin-induced heart failure in rats: possible mechanism of cardioprotection. Biochem Pharmacol. 2013 Nov 1;86(9):1301-10. doi: 10.1016/j.bcp.2013.07.005. Epub 2013 Jul 17. Doxorubicin is an anti-neoplastic agent with cardiotoxicity. 3. 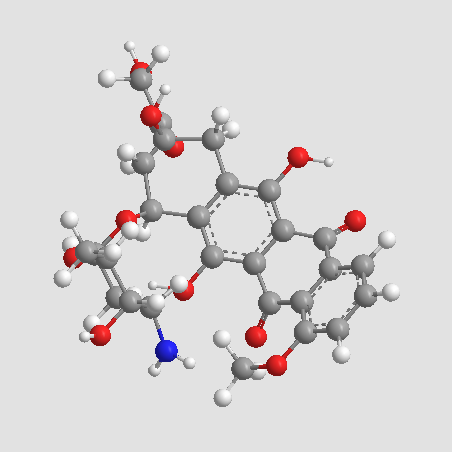 N1-guanyl-1,7-diaminoheptane (GC7) enhances the therapeutic efficacy of doxorubicin by inhibiting activation of eukaryotic translation initiation factor 5A2 (eIF5A2) and preventing the epithelial-mesenchymal transition in hepatocellular carcinoma cells. Exp Cell Res. 2013 Oct 15;319(17):2708-17. doi: 10.1016/j.yexcr.2013.08.010. Epub 2013 Aug 16. 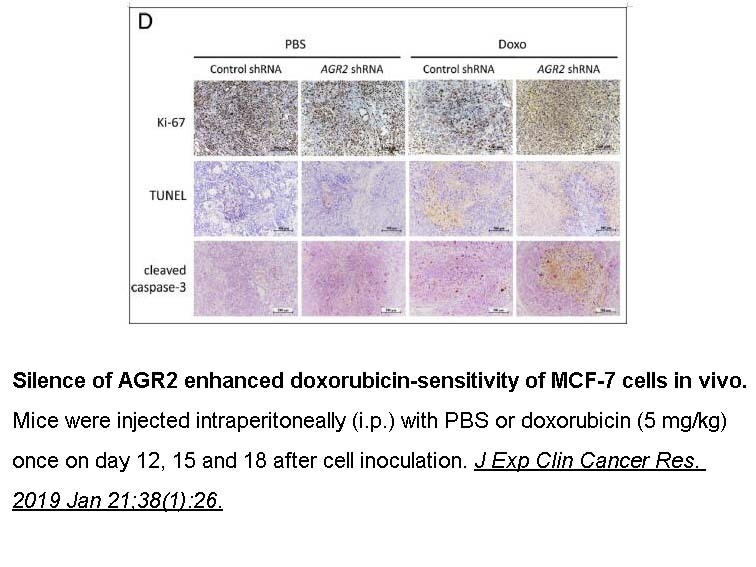 GC7 enhanced doxorubicin cytotoxicity and inhibited doxorubicin-induced EMT in epithelial HCC cells. 4. Lapatinib and doxorubicin enhance the Stat1-dependent antitumor immune response. Eur J Immunol. 2013 Oct;43(10):2718-29. doi: 10.1002/eji.201242505. Epub 2013 Jul 11. Doxorubicin enhanced tumor infiltration by IFN-γ-secreting Tcells and decreased the content of TAMs in MMTV-neu mice. 5. Clinical risk factors of PEGylated liposomal doxorubicin induced palmar plantar erythrodysesthesia in recurrent ovarian cancer patients. Gynecol Oncol. 2013 Dec;131(3):683-8. doi: 10.1016/j.ygyno.2013.09.031. Epub 2013 Oct 4. Although a few factors, including body composition, age, gender, changes in monocyte count and repeated dosing, have impacts on pharmacokinetic properties of PLD, clinical risk factors of ovarian cancer patients who have PPE and receive PLD are rarely identified. Brayfield, A, ed. (2013). 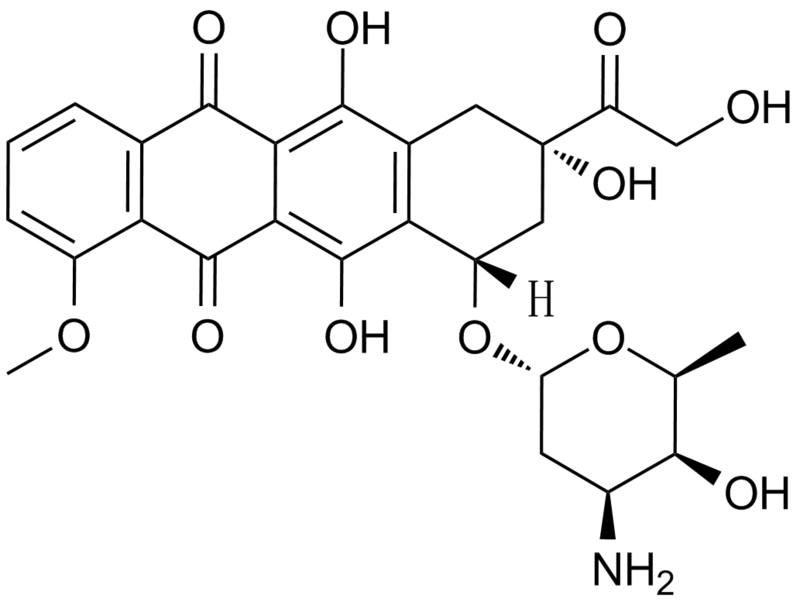 Doxorubicin. Martindale: The Complete Drug Reference. Pharmaceutical Press. Retrieved 15 April 2014. Pommier Y. , et al. (2010). DNA topoisomerases and their poisoning by anticancer and antibacterial drugs. Chemistry & Biology 17 (5): 421–433. Boucek RJ. , et al. (1987). The major metabolite of doxorubicin is a potent inhibitor of membrane-associated ion pumps. A correlative study of cardiac muscle with isolated membrane fractions. J of Biol Chem 262: 15851-15856.